After a tough race at Mazda Raceway Laguna Seca last month, the contingent of Ford Mustang race cars looked to bounce back at the SCCA World Challenge event as part of the Belle Isle Grand Prix this weekend. Coming off their first podium finish of the year, local team Capaldi Racing was coming out in full force Mustang race cars, and defending champion Tiger Racing managed to patch up their duo battered and bruised race cars in time for the trip to Detroit. Roger Miller, Alec Udell and Jason von Kluge also brought out their Mustangs for a full field of pony cars. Things started out in positively with Capaldi Racing’s Aaron Povoledo setting the fastest time in a very wet practice Friday practice session. Povoledo continued his fast pace through qualifying, where he placed second, but the rest of the Mustang field struggled to keep up. Alec Udell qualified in eighth, Justin Bell in 9th, Jason von Kluge in 11th and Dane Moxlow in 12th. Typically Mustangs have been able make up for poor qualifying by gaining positions during the race, but unfortunately it was nearly impossible at Belle Isle. In the first of the two races only six of the laps were completed under a green flag, with the rest being run under caution. Unfortunately the incidents that brought out the yellow flags involved Mustangs, with three being knocked out of the race. Povoledo managed to claim the last podium position, his second in two races, followed by Von Kluge in 5th and Bell in 7th. Starting positions for the second race on Sunday are determined by the finishing order of the first race, which meant that the Mustangs had a tough challenge ahead of them. Once again the race was dominated by several laps under caution, limiting the ability of Mustangs to move up in the running order, but both Von Kluge and Bell took advantage of the available laps under green, moving up to 4th and 5th, respectively. Dan Moxlow in the second Tiger Racing Mustang Boss 302S had his best finish of the year, taking home seventh place in the GTS class. Povoledo, who had been running the fastest Mustang all weekend, had his luck run out and he ended the race with a DNF. Currently Justin Bell sits in fourth place in the GTS driver’s championship, and Ford is third in the GTS manufacturer’s championship behind Chevrolet and Acura. The next SCCA World Challenge race is at Mosport from June 22-24. 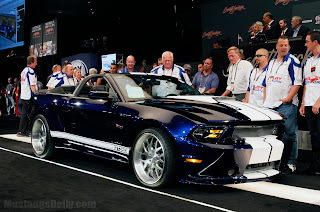 This entry was written by by MustangsDaily (Mustangs Daily) and posted here on Tuesday, June 5th, 2012 at 10:37 am and is filed under boss 302s, ford mustang boss 302s, Motorsports, mustang boss 302s, SCCA World Challenge, world challenge, world challenge gts. This article was not written by us, rather gathered using RSS feeds listed here. We take no credit for this article. You can leave a response, or trackback from your own site.